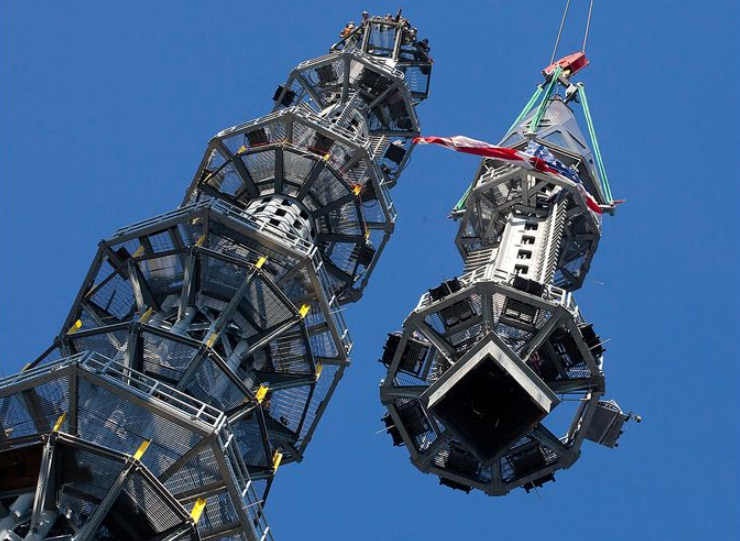 Captain Rick: Construction workers bolted the 408 foot tall, 758 ton spire atop One World Trade Center, raising the iconic 104-story building to a height of 1,776 feet, symbolic of the year the United States gained its independence. 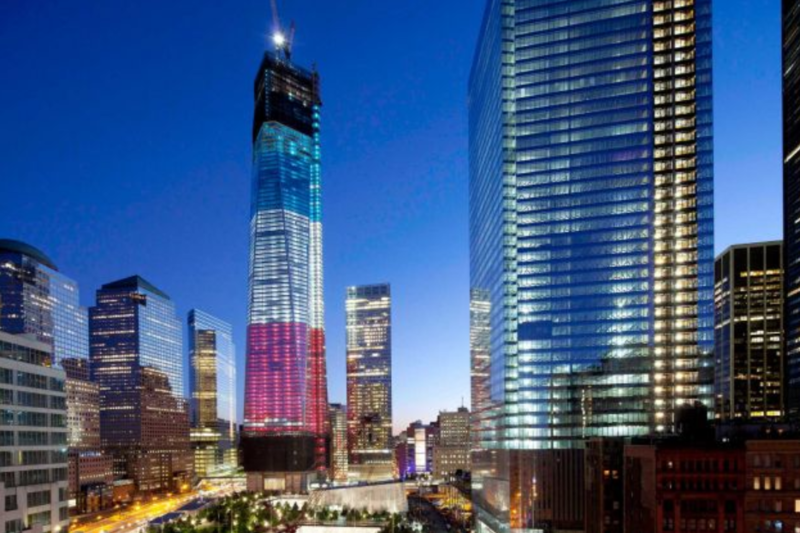 It is now the tallest building in the Western Hemisphere and makes a bold statement in the sky above New York City that it has made a comeback from the September 11, 2001, terror attacks. An LED-powered light emanating from the top of the spire will change colors and be visible from 10 miles away when lit sometime during the next few months. My guess is it will be lit on July 4, 2013 and be the highlight of NYC’s fireworks spectacular, a show I anticipate will capture the eyes an hearts of the world. The installation brought cheers from New Yorkers, and from people around the country. "This milestone at the World Trade Center site symbolizes the resurgence and resilience of our state and our nation," New York Gov. Andrew Cuomo said in the statement. The photos above show the current NYC skyline, rendering of the completed complex and the spire being hoisted. 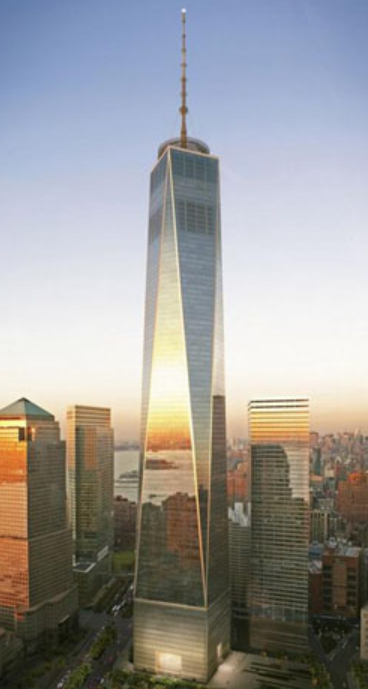 Formerly called the Freedom Tower, One World Trade Center is one of four skyscrapers being built around the site of the fallen Twin Towers in a partnership between developer Larry Silverstein and the Port Authority of New York and New Jersey, which owns the site. Construction on the $3.8 billion building began in April 2006 at the northwest corner of the 16 acre site, just north of the hallowed ground known as Ground Zero, where the original twin towers were destroyed in the Sept. 11, 2001, terror attacks. The spire contains 18 steel sections and three communication rings. The heaviest section, weighing 67 tons, will be an antenna for a television broadcast facility in the building. The building still has significant construction before its scheduled 2014 opening. Tenants include the magazine publisher Conde Nast, the U.S. government’s General Services Administration (GSA) and Vantone Holdings China Center, which will provide business space for international companies. The 72-story 4 World Trade Center is under construction at the southeast corner of the site.